£50 refundable deposit to cover any damage or if the caravan has not been left clean. 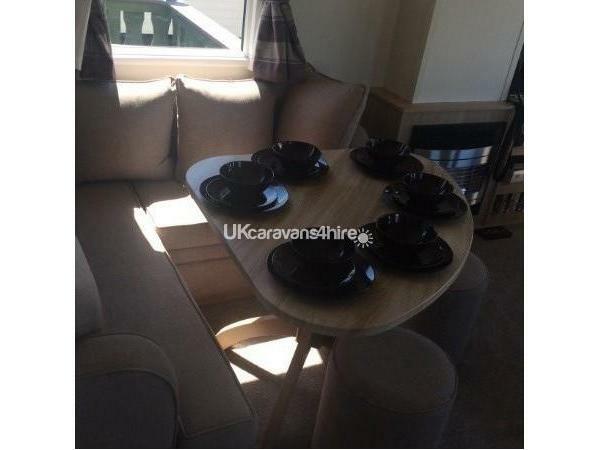 This caravan is a brand new double glazed, central heated and 8 birth. 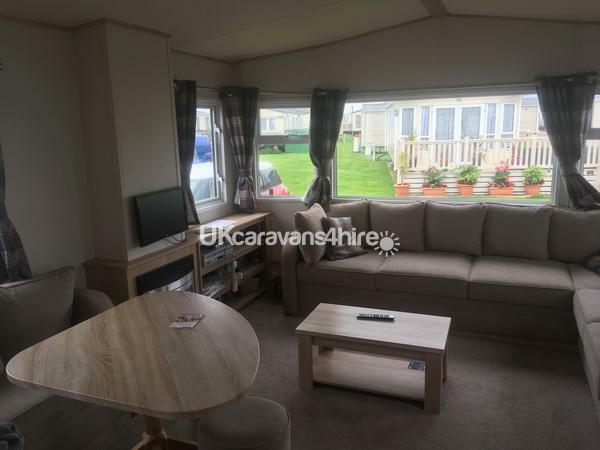 The caravan is very homely with the sofa converting to an additional double bed, so along with the 3 bedrooms (one double en suite and two twins) it can accommodate 8. The living room has ample seating area and dining area. There is a DVD and video player with a supply of DVDs and videos. The kitchenarea is very well equipped with conventional oven and grill, toaster, four ring hob, microwave, fridge and separate freezer, kettle, cafeteria as well as the usual cutlery, cooking equipment and crockery. The bedrooms all have lots of storage. 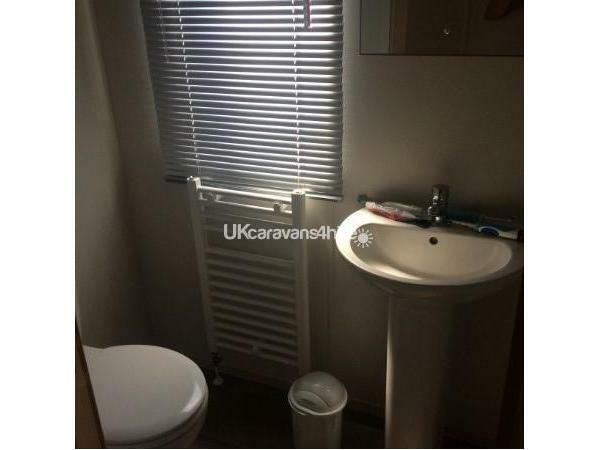 The bathroom has sink, toilet and a good sized shower. The veranda is gated. A travel cot is available. The caravan is situated in a quiet cul-de-sac within 100m of the Embassy club, Oasis swimming pool, fun fair and beach. 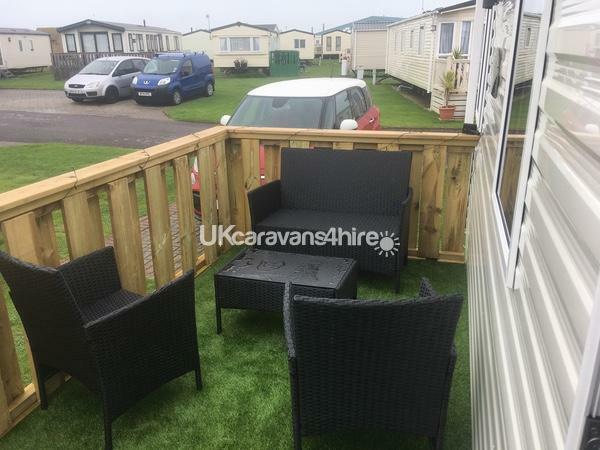 There is a lot of storage which makes make accommodating 8 easy, all in all this is a lovely caravan for a family holiday. West Sands has a great entertainment program for both adults and children, during the day and evening, there aren't many sites with as much to offer as Bunn Leisure do. Please have a look at there website for full details. The oasis swimming pool boasts a slide, lazy river, children's pool, main 25m pool and steam room. Additional there are beauty treatment nets and a gym available. PAYMENT ACCEPTED BY DIRECT BANK TRANSFER, PAYPAL OR CREDIT CARD. Additional Info: Oasis swimming centre including pool with lazy river, learning pool and slide. Also gym, sauna and steam room.